Dichotomous reasoning involves viewing situations as binary rather than continuous. 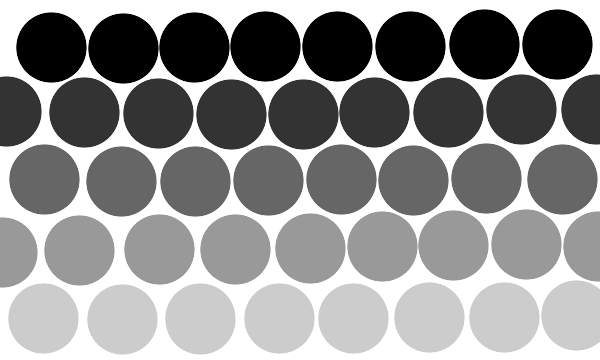 Dichotomous sometimes called “black or white” thinking, ignores shades of gray. A dichotomous thinker only acknowledges right-wrong, ignoring dilemmas with no right choice and non-normative information; or success-failure, ignoring effort and where success moved to failure; or perfect-incompetent, ignoring learning and practice gains; and big-small, ignoring medium and all sizes in between. You can marry for love or money. You can’t trust rich people. I can either be rich or be loved. I can either have tremendous wealth or be kind and trustworthy. I can either have money or have a deep, meaningful life. Now your options are limited to keep the money and be superficial, or give up the money and have depth. To get more options, try rewriting those same thoughts with and instead of or. I intend to be wealthy and live a life filled with love by paying attention to the feelings of my self and others. I intend to be rich and trustworthy and kind by staying in touch with my values. I intend to have both a wealthy and deeply fulfilling life by giving to others who are less fortunate. Now you have at least 3 options, and possibly many more. To help support your new thinking, find examples (called ‘exceptions’) of people in the world who represent the and-statement. Paul Newman had wealth, and love in his life, staying married to Joanne Woodward from 1958-2008. Oprah is very rich and also stays in touch with her values, people trust her, and see her as kind. Bill Gates is super rich and also has a meaningful life through his many foundations. To extend the positive benefits of the exercise and alter negative behaviors in your own life, take a personally held set of dichotomous beliefs and rewrite them as a continuum, filling in the middle with and types of statements. Online therapy is a growing area of the mental health field and early research shows that it can be just as effective as therapy for many populations. Online therapy, also known as e-therapy, e-counseling, tele-therapy or cyber-counseling, can occur through e-mail, video conferencing, online chat, or Internet phone. Skype, and encrypted digital software through third-party sites, have made online private practice accessible for a broader swath of patients, including those who have difficulty with office treatment. Some examples of these types of clients are parents with kids with disabilities, those with physical or psychological limitations (e.g., agoraphobia, nerve pain, etc. ), people who work more than 40 hours a week, and the list goes on. Convenience also is a factor; remote capability addresses some pragmatic barriers, such as transportation difficulties, lower overhead and fees for services, and one may no longer need to cancel appointments due to minor or even some major inconveniences, like broken legs, being out of town, etc. There are some issues with online treatment; eye contact, erratic Internet connections, exploitation, privacy, and reimbursement are all issues that must be addressed by the therapist and client prior to beginning online treatment. Clients should verify therapist credentials in the first session by asking to see the license or have a facsimile emailed. Clients may also want to inquire as to the privacy precautions they can take on their end that might further protect information being shared across the web during session. Some examples are always making sure to fully exit all other programs, carefully ending session by signing out and closing whatever application was used for treatment, and using a private location for the session. I currently offer online therapy services in the form of Skype videotherapy and teletherapy over the phone. If you are interested in my services, please contact me! Note: In keeping with my licensing requirements, I only work with clients currently within the Texas borders. Frueh BC, Deitsch SE, Santos AB, et al. (2000) Procedural and methodological issues in telepsychiatry research and program development. Psychiatric Services, 51:1522-1527. Video games are a good tool to extend play therapy into adolescence (Ceranoglu, 2010) since this medium is the preferred form of play for this age group; 97% of American teens ages 12-17 report gaming (Lenhart et al., 2008). In addition to being in the language most preferred by teens, it is well-known that teens are notoriously apathetic to talk therapy. Playing games allows for a kind of parallel activity that can help them open up about deeply personal issues they may not otherwise discuss. Prosocial games have been found to improve social cognition (Greitemeyer, Osswald, & Brauer, 2010). Ceranoglu, T. A. (2010). Star Wars in psychotherapy: Video games in the office. Academic Psychiatry, 34(3), 233-236. D. H., Ang, R. P., & Tan, H. C. (2008). Strategies for designing effective psychotherapeutic gaming interventions for children and adolescents. Computers in Human Behavior, 24(5), 2217-2235. González-Fernández, M., Gil-Gómez, J.-A., Alcañiz, M., Noé, E., & Colomer, C. (2010). eBa ViR, easy balance virtual rehabilitation system: A study with patients. Annual Review of CyberTherapy and Telemedicine, 8, 49-53. Greitemeyer, T., Osswald, S., & Brauer, M. (2010). Playing prosocial video games increases empathy and decreases schadenfreude. Emotion, 10(6), 796-802. Jordan, N. A. (2009). This is why we play the game: A quantitative study of attachment style and social anxiety’s impact on participation in online gaming relationships. Syracuse University Ph.D. Retrieved from http://search.proquest.com/docview/608589366?accountid=7122 ProQuest Dissertations & Theses (PQDT) database. Parsons, S., Mitchell, P., & Leonard, A. (2004). The Use and Understanding of Virtual Environments by Adolescents with Autistic Spectrum Disorders. Journal of Autism and Developmental Disorders, 34(4), 449-466. Spence, I., & Feng, J. (2010). Video games and spatial cognition. Review of General Psychology, 14(2), 92-104. Wuang, Y.-P., Chiang, C.-S., Su, C.-Y., & Wang, C.-C. (2011). Effectiveness of virtual reality using Wii gaming technology in children with Down syndrome. Research in Developmental Disabilities, 32(1), 312-321. I will begin seeing clients Feb 1, 2012. If you would like an appointment, email or phone me and we will discuss your needs. As a marriage and family therapist, I enjoy working with the Satir Model (Satir, 1983; 1988; 1991), which is an experiential systems approach that suggests quality relationships are more likely when we effectively communicate from the Self. To do this, we must know the self, take personal responsibility for the self, and be willing to share the self with others. Good communication skills are also needed. When these qualities are present, there is an overall sense of well being that allows for creative and flexible problem solving. When absent or diminshed, things get stuck. If you feel stuck and want to get moving again, call me. In our first session, we will do a brief assessment of the issues, set some joint goals, and make a plan that will identify where we want to go and how we might get there. In subsequent sessions, we will work towards your goals by examining the issues from different perspectives, identify conflict and communication patterns, and seek for a “transformative idea” in your own experiences–The Key–that will continue to promote growth in the system long after our journey together ends. While each journey is unique and the length of therapy depends on client need, we are sure to know when you have arrived at the destination. The Satir Model has been applied successfully to children (Haber, 2011; Smith, 2010), individuals (Morrison & Ferris, 2002; Yang Li & Vivian, 2010), couples (Lee, 2009; Morrison & Ferris, 2002), families (Haber, 2011; Seligman, 1981), and groups (Root, 1989) to address a variety of concerns, such as depression (Caston, 2009; Srikosai, 2008), pathological gambling (Lee, 2009), suicidality (Smith, 2010), and alcohol dependence (Srikosai, 2008). The Satir Model integrates well with Emotion Focused Therapy (Brubacher, 2006), Social Construction Theory (Cheung, 1997), and cognitive-behavioral/mindfulness therapies (Claessens, 2009). The wide applicability and flexible nature of the model makes it a good fit for most cultures, including collectivist cultures (Yang, 2012; Bermudez, 2007; Cheung & Chan, 2002) and GLTB community (Carlock, 2008). In my own practice I have found clients to become quickly engaged and to be willing to stay the course to get the desired results a majority of the time. To evaluate progress I run a brief spot check Session Rating Scale) over the course of treatment that assesses four domains of client-therapist-treatment interaction. Occasionally, we will evaluate outcomes using the ORS (Outcome Rating Scale) that briefly assesses four domains of functioning. These results are used to refine the process and enhance the journey. In addition, I use the treatment plan to help track positive and negative change as related to goals. Markers for termination are 1) client has reached all or some of the identified goals, 2) client/therapist feels the client is ready to take over, 3) there is no progress in treatment (referrals are discussed), and/or 4) other unique indicators are processed as keys for termination. It is my goal that you get more of the life you want and my mission is to empower you to do just that! Here is a link to my latest publication. Many thanks to David and Glenn. For many people the holidays are a stressful time. For those who have lost a loved one, the holidays can be especially difficult. Here are some tips from James E. Miller that might be helpful during this time of year. 1. Accept the likelihood of your pain. • Chances are it will be a painful time. • Your pain is a sign that you have been blessed to have close relationships. • Sometimes the anticipation is worse than the actual experience. • You will have emotional reactions to the impact of the holidays. Depression. Fear. Anger. Guilt. Apathy. • You must find a release for what is going on inside of you. • Express yourself in a way that works for you. Possibilities are limitless. Cry. Talk. Journal. Listen to music. • Identify what will be the more difficult parts of the holidays. • Ask for help in thinking about what you will do and carrying out tasks. • Give thought to the various choices you have in spending the holidays. • Give yourself the freedom to change your plans. 6. Take charge where you can. • Identify what aspects of the holidays are meaningful to you and which ones you can forego. • Decide if there are traditions that can be modified to fit the new circumstances of the loss. • Try not to make drastic changes, but some changes can be healthy and important. • Eat healthfully and drink wisely, maintain an exercise program, get some sleep, and practice those things that give you energy. 7.Turn to others for support. • Seek out those who will let you talk or cry or do whatever you need to do. • Give yourself time to rest and be forgiving of yourself. • Don’t over commit yourself and allow yourself to cancel plans if you need to. • Give yourself permission to ease holiday demands and set easy-to-attain goals. • Find an object that you can carry, wear, use, or place in easy sight that will link you with the one who died. • Create a small remembrance area in your home. • Honor your loved one with a ritual of remembrance. • Don’t force yourself to remember if you don’t feel up to it – you’ll know when the time is right. 10.Search out and count your blessings. • Remain as open as you can to what you appreciate. 11. Do something for others. • Find moments to place your attention outside of yourself. • It can be something that takes an hour or days – see what is right for you. • Volunteer, help a neighbor, or assist a stranger. The possibilities are limitless. • An inner part of yourself is involved in the grief, separate from your body, mind, or feelings. • Honor the questions that you may find yourself asking that affect your spiritual beliefs. • Consider making room in your days for the expression of your soul (prayer, meditation, reading, etc.). • Stay open to the demands of this experience. There is hope for your healing and growth. Personality disorders generally require psychotropic medication and psychotherapy treatment due to the prolonged and severe nature of symptomology and level of impaired functioning. Unfortunately, treatment may be difficult to initiate or maintain due to barriers, such as patient denial, medication attrition, expense, and duration of treatment. Despite these obstacles, therapy is warranted as most of the types have severe consequences not only for the patient but for his/her family and social networks. Psychodynamic psychotherapy: assumes perceptions are shaped by early life experiences. Thus the focus of treatment is aims to identify perceptual distortions and their historical sources. Goals may include the development of more adaptive modes of perception and response. Treatment is long term; usually extended over a course of several years at a frequency from several times a week to once a month. Cognitive therapy (also called cognitive behavior therapy [CBT]): assumes cognitive errors based on long-standing beliefs influence the meaning attached to interpersonal events. Focus of treatment is how people think about and perceive heir world. Goals may include reformulating perceptions and behaviors. This therapy is typically limited: duration of 6-20 weeks (still more than the national average), once weekly; however, in the case of personality disorders, episodes of therapy are repeated often over the course of years. Mindfulness therapy may be useful in treating PDs. Group psychotherapy allows interpersonal psychopathology to display itself among peer patients, whose feedback is used by the therapist to identify and correct maladaptive ideas, communication, and behavior. Sessions are usually once weekly over a course that may range from several months to years. Ease of access and duration of services, as well as the interpersonal nature of groups can make them a good option for those with PDs. Dialectical behavior therapy (DBT): This is a skills-based therapy (developed by Marsha Linehan, PhD) that can be used in both individual and group formats. Assumes maladaptive coping and focuses on development of coping skills to improve affective stability and impulse control and on reducing self-harmful behavior. Tested for BPD, weekly one-on-one counselor and group training sessions on skills such as distress tolerance, interpersonal effectiveness, emotion regulation and mindfulness skills can be helpful. More research is needed on other PDs. relationship patterns in human systems (Jenkins and Asen, 1992). Family therapy is usually suggested when either PD symptoms are negatively impacting the functioning of the family, or when problems in the family may be making the PD symptoms worse. Sometimes these two problems interact — the BPD symptoms impair family functioning, and poor family functioning makes the BPD symptoms worse. Integrative Relational Psychotherapy (IRP): Combining a rigorous biopsychosocial model of personality with a relational framework for patient assessment and treatment planning, IRP is designed to produce rapid and sustained systemic change in patients suffering from virtually all DSM-identified personality disorders. Linehan, M.M. (2000). The empirical basis of dialectical behavior therapy: Development of new treatments versus evaluation of existing treatments. Clinical Psychology: Science and Practice,(1), 113-119. Verheul, R., Van Den Bosch L.M., Koeter, M.W., De Ridder, M.A., Stijnen, T., Van Den Brink, W. (2003). Dialectical behavior therapy for women with borderline personality disorder: 12-month, randomized clinical trial in The Netherlands. British Journal of Psychiatry, 182, 135-40.